Anyway, here's a few from the past few days. 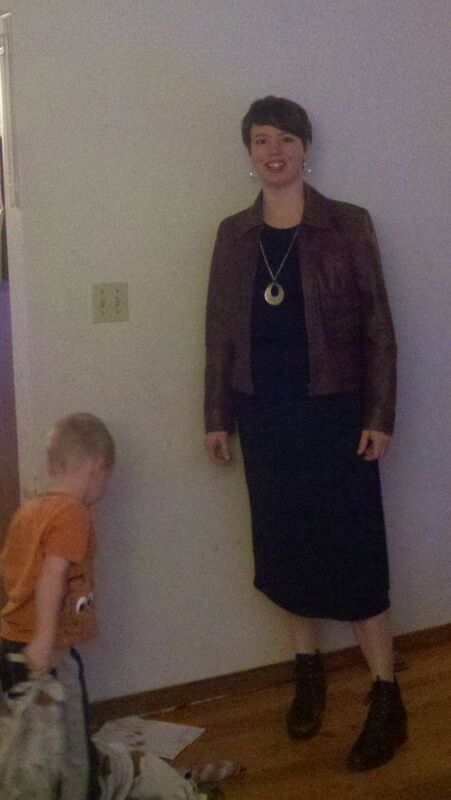 #1 The closest I have to a bomber over a dress - it's a black midi-lengh sheath dress (is that's what it's called? basically a long straight tube of fabric with arms and a head hold cut out). Ceit's asking about finding a dress like the one in the post made me realize that I had that dress, and could wear a bomber over it. I'm not totally sure it worked, but I felt sassy in it. #2 when I saw the pic of this one, I almost changed, but my husband told me that it actually looked good in person, just didn't photo well, so I left it on. 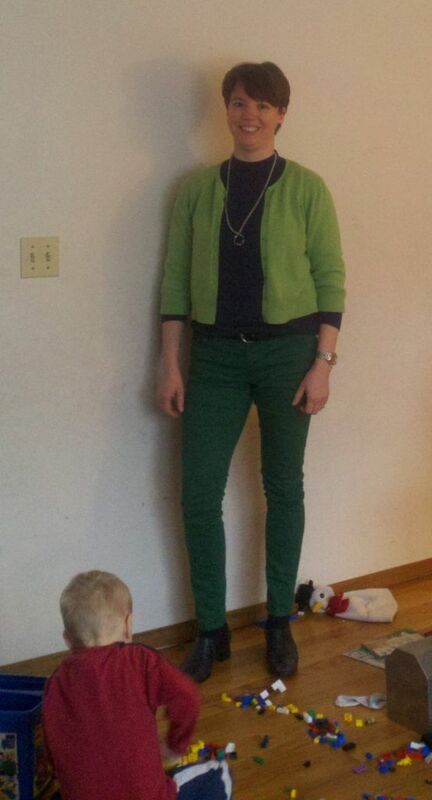 It's green jeans, a blue sweater, and lime cardigan. The green jeans are super comfy! #3 white jeans, red shell and houndstooth jacket. I liked this one pretty well. love them all... surprisingly, my fave is the the wearing of all that green! They are all great on you! My favorite is #1--smashing! I really like the way the whole outfit works--dress, pendant and earrings, bomber, and those short boots! You look a mile tall. The greens and blue work, to my eye! That looks like a fun, casual outfit, and I'm drawn in by the saturated colors. The only thing I would change is the shoes; the lines between pant hem, sock, and shoe top are a little distracting to me. The boots from 1 would work with this outfit nicely, I think. #3 is sassy and fresh--another winner! I like the perfect slouch of those white jeans. Don't worry about being a forum hog -- there are times when it's really helpful to post daily. When we're busy, we just won't catch every post! These are amazing! On a roll, Amy. Love #1, giddy over the green jeans, and so impressed with the classic but modern play of black/white/red. The white on the bottom is so much more modern that the typical black. I must copy this one! I love all of these! Yes, that is the kind of dress I am looking for. The green outfit makes your legs look so long...and love the houndstooth with the jeans! Kate, this kind of dress is ALL OVER thrift stores here. I have it in black and navy. And the green is so fun to wear. I may like it even more than the red, just because it's less of an expected color in my mind. But that may be just because they're still new.. These are all good outfits. Your style is really evolving recently. I've loved all your recent outfit posts. #3 is my favorite of these because I like the clean look of the black/white and red, but they all look good. These are really nice. I really love the houndstooth and white. I love that you wear white jeans with 5 kids and a very active doggie. That steals the show. KILLER! p.s Have been in white jeans all weekend, and will wear white jeans again today. High five! I love the white jeans, too! Great pairing with the jacket. I love how you play around with different shapes and mixes. My fav is #3, the white jeans and the houndstooth is very modern. Great outfit!